Bitcoin futures are probably the next stage when it comes to mainstream adoption of the most famous cryptocurrency. Bitcoin, along with a host of other cryptocurrencies came a long way. From starting off as an experiment the cryptocurrency, led by Bitcoin became quite popular. As the price started to surge the cryptocurrency gained in leaps and bounds. At one point, there were talks about Bitcoin replacing the traditional fiat currency. Due to the decentralized blockchain technology, Bitcoin was also seriously competing with gold. Gold, as you might know, is an asset that investors flock to in turbulent times. The surge in Bitcoin prices, especially into the early months of 2018, saw just about everyone buying into the hype. It is no surprise that how quickly Bitcoin became a bubble. Prices started to crash almost instantly leaving many new buyers to hold the bag. Regulations, speculations and government crackdown and most importantly, the confusion on the valuation of Bitcoin are just some of the reasons behind the crash. Still, despite the negativity, cryptocurrencies are only in the early stages. It would take a few years for cryptocurrencies such as Bitcoin and Ethereum to gain mainstream acceptance once again. Cryptocurrencies started evolving only since 2008. This started to lead to a number of other tokens also known as cryptocurrencies. It is estimated that there are over 1000 cryptocurrencies today. The combined market share is said to even dwarf the market cap of a company such as IBM. There are many debates about cryptocurrency, especially when one claims them to be an alternative to the fiat currency. The debate rages on, on two particular points. Is cryptocurrency a medium of exchange? Can cryptocurrency be a store of value? These two questions are vitally important if one considers cryptocurrency to truly replace the traditional medium of exchange currently in use. One of the biggest advantages of cryptocurrencies is its decentralized blockchain model. With no single entity controlling the cryptocurrency, Bitcoin started to gain acceptance. This view however kept central bankers across the world awake. Thus, the regulation and crack down on exchanges started. Still, one of the biggest developments came from the launch of Bitcoin futures. This led to optimism that there would be more financial products developed such as Bitcoin ETFs and other variants. What are Bitcoin futures contracts? Bitcoin futures are relatively new. The futures contracts started trading just under a year ago. On December 16th 2017, the Chicago Mercantile Exchange (CME) Group launched the first Bitcoin futures contract. 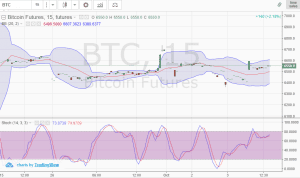 The futures contract, trading under the ticker BTC was met with optimism and hype. For many who couldn’t ride the gravy train finally had access to a standardized product. 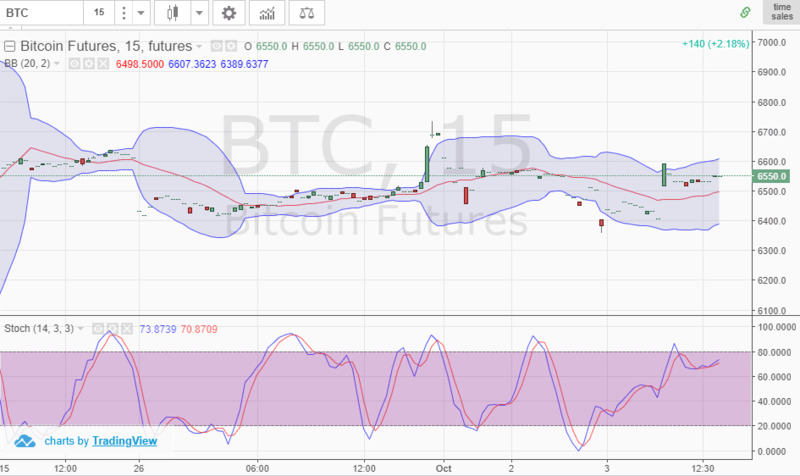 The launch of the Bitcoin futures also coincided with the famous volatility. Cryptocurrencies are known for their volatility. And traders love volatility when it comes to speculation. On the opening day, Bitcoin futures fell 2.05%. At the Chicago Board of Options Exchange (CBOE), price surged 19% just the week before. 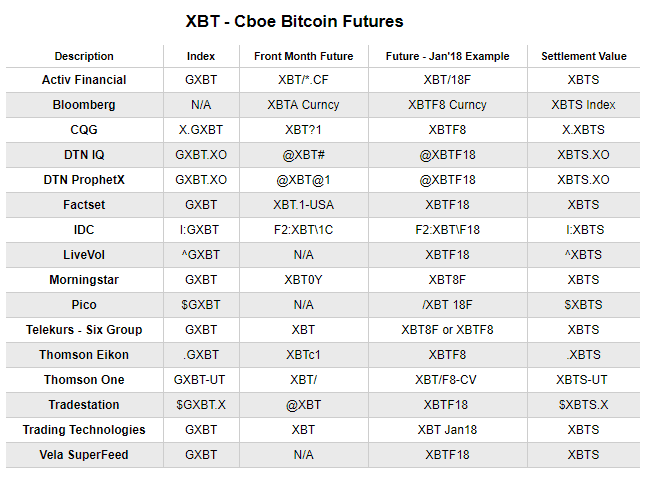 CBOE also launched Bitcoin futures (XBT) trading just a week before CME’s futures contract went live. Bitcoin futures were so popular that on the first day of trading, the CBOE website buckled under the flow of traffic. At one point, trading stopped when Bitcoin futures surged 10%. While this was something new for exchanges to witness such sharp price movements, it was just another day in Bitcoin world of trading. The popularity of Bitcoin futures surged for the primary reason that traders could get their hands on cryptocurrency trading in a legal way. Trading Bitcoin, such as directly buying the Bitcoins for your ewallet has some legal problems. Tax authorities around the world are eager to find a way to tax bitcoin transactions. Both tax authorities and government officials came down hard on the cryptocurrency. Some even went as far as to call cryptocurrencies the currency of criminals. China, for example, invoked a ban on one of China’s largest exchange. In the United States, Federal authorities are constantly on alert for dubious exchanges. The clampdown on Bitcoin continues and will continue for a while. Under the above circumstances, Bitcoin futures were a welcome change. Traders now could trade or speculate in Bitcoin legally. Bitcoin futures contracts are exactly what you think they are. They are no different from other futures contracts such as precious metals or pork bellies or OJ futures. Bitcoin futures are derivative contracts. They track the price of the underlying security, the Bitcoin. Bitcoin futures enables you to buy (go long) or sell (go short), thus giving traders the ability to trade on either direction. Bitcoin futures are perhaps the closest you can get to trading Bitcoin itself. Due to the ability to long or short the Bitcoin futures, this also attracts algo traders and speculators of all kinds. In most cases, those who hold actual Bitcoins can use the futures contracts to hedge their positions. Bitcoin futures are still in their early stages. So the early adopters of Bitcoin futures are mostly cryptocurrency enthusiasts. The latest addition is Crypto Facilities. This is a company that is reputable in the derivative markets the firm is also legal and complies to U.S. regulations. Crypto Facilities settle contracts held for delivery. However, the catch is that the settlement is done in fiat money rather than Bitcoins. 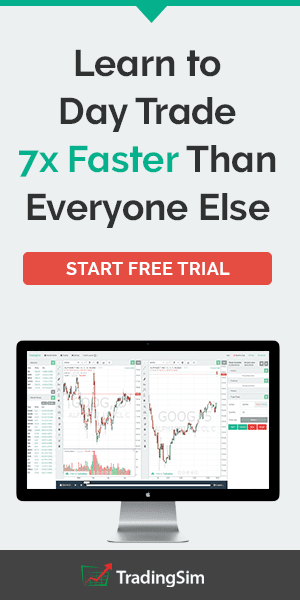 This enables non-crypto currency enthusiasts to also trade Bitcoin futures to settle for fiat money. One of the biggest obstacles for the Bitcoin futures has been pricing. 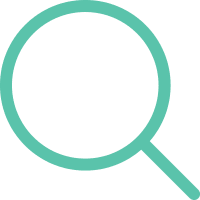 Because the cryptocurrency prices vary depending on the exchange, the need for a standard price arose. Since November 2016, Crypto Facilities and CME Group use the Bitcoin Reference Rate or BRR. The BRR is based on the pricing of Bitcoin from other exchanges. Bitstamp, GDAX, itBit, and Kraken, are the biggest exchanges in this area. Calculating the BRR is a bit complex. The price is calculated in real time. The BRR takes all the Bitcoin USD trades from the participating exchanges between 3 and 4 p.m. London time. This is divided into an interval of 5 minutes. For each of these intervals, the volume weighted median of the price is calculated. You can read more details about the BRR here. Besides the BRR, there is also the Bitcoin Real-Time Index or BRTI. This follows the price of Bitcoin in real time. This is a more accurate measure of price when you compare to the Bitcoin reference rate. Of course, both these prices can be monitored on the CME group’s website. The BRR is useful in a number of ways. For one, this reference rate is relevant for the futures contracts and also for the pricing in options. When a futures contract expires or when you want to exercise an option, the BRR is the reference rate for settling the difference. The BRTI, on the other hand, tracks the real-time prices. The difference between BRTI and the BRR is that BRTI is only for tracking the prices. When it comes to initiating a position, the BRR price applies. The Bitcoin futures from CME group are cash settled. This means that there is no delivery of the underlying security. In other words, if you want physically buy Bitcoin, Bitcoin futures will not allow you to do so. When a Bitcoin futures contract expires, the settlement is the difference between the closing price and the BRR. This difference is then settled in cash. An interesting point to note is that Bitcoin is not a physical asset but a virtual currency. You are mistaken if you think that you can use Bitcoin futures for physical delivery. There is no such thing. As you can see, the Bitcoin futures are purely speculative, settled for cash. The settlement currency is in U.S. dollars. Bitcoin futures have a tick size, just like any other futures contract. The minimum tick size, the amount by which the price of Bitcoin increases is 5 USD per BTC. In contract terminology, this is 25 USD per futures contract. The Bitcoin futures also trade similar to other futures contracts with the calendar months. The listing is for the nearest two calendar expires. The last trading day before the futures contract expires is the Friday before the expiry date. The minimum contract size you can trade is 5 contracts (this brings the minimum tick size to 25 USD). Cryptocurrencies, in general, are very risky assets to trade. Volatility is one of the big factors that is common to cryptocurrency trading. Bitcoin, as the leading cryptocurrency is therefore not immune to the wild swings as well. 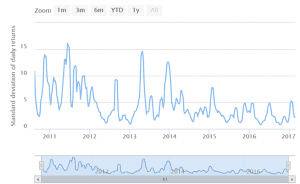 The volatility comes despite Bitcoin boasting the highest volume of trading activity among all other cryptocurrencies combined. 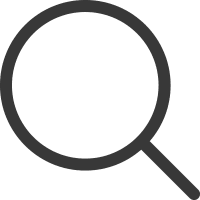 Therefore, to be successful in trading Bitcoin futures, you need to know what you are doing. For one, having enough capital to cover the margins in case of wild swings is a starting point. Sometimes, price can spike without a reason. Unlike traditional futures contracts where there is something fundamental to fall back upon, this is not the case with cryptocurrencies. There are a number of factors that can influence the price spikes and dips. A couple of large block orders can also push prices around. Secondly, regulatory news about cryptocurrencies, even as far as China has the ability to cause volatility. On the other side, Bitcoin futures are one of those few assets where technical analysis works really well. Therefore, you can use the futures contracts to trade based on your trading strategies. Most speculators in Bitcoin futures often make use of algorithmic or automated trading strategies. Because of the volatility, a carefully selected automated trading system can work wonders. But of course, there are still some risks regardless of whether you use an automated trading system or trade manually. Practice makes one perfect. 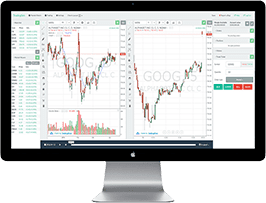 And for those who are raring to dive into Bitcoin futures trading, Tradingsim’s BTC futures allow you to practice your trading. You can make use of the various inbuilt technical indicators to test your strategies. After you log in to Tradingsim, select the Futures tab to find the BTC ticker. So far, we learned about cryptocurrencies and its ascent into Bitcoin futures. There are also other derivatives such as BTC contract for differences to name a few. One can choose what type of contract to trade. However, for those residing in the United States, trading the Bitcoin futures is a safer option. Bitcoin futures are standard futures products. You get to see the price transparency and there is also no risk of a counterparty default. You can trade on the exchange via a broker, so this brings legitimacy to Bitcoin futures as well. Bitcoin futures are regulated by the SEC and the CFTC, it also makes it legal to trade the futures contracts. At the time of writing, various industry professionals have been pushing for launching many other vehicles. For example, Bitcoin ETFs are currently being negotiated. When the ETFs do launch, you can expect to see another wave of resurgence in Bitcoin. For the moment, questions remain on the validity of cryptocurrencies. While there has been a mass adoption of the underlying Blockchain technology, authorities are still hesitant. Cryptocurrency enthusiasts maintain that Bitcoin and the likes could soon replace fiat currency. But it is anyone’s guess that this is merely speculation. A central bank and government authorities simply would not give up that easy. There is also talk about Bitcoin being a safe haven. But this also turned out wrong. Perhaps it is to do with the timing. Anyone who knows something about cryptocurrencies has heard about the bubble. While some of the most popular cryptocurrencies have reverted to the mean, the question is where do they go from here? Will Bitcoin and as a result Bitcoin futures be able to stabilize and trade like normal assets? Or will Bitcoin eventually lose its value? Time will tell. But until then, Bitcoin futures are a perfect way to hedge your Bitcoin holdings or a great way to speculate on the volatility and make profits. How Do Interest Rate Hikes Impact Interest Rate Futures?